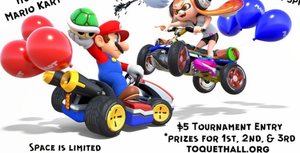 Game Night at Toquet Hall gets kicked up a notch on September 15th with our Mario Kart 8 Super Tournament. There will be 6 screens with 8 head-to-head matches at a time! This will be a bracketed random draw tournament with prizes to the 1st, 2nd, & 3rd place winners. High School and Middle School divisions. Game Night is Free but Tournament Entry is $5. Toquet Hall Teen Center is located at 58 Post Rd E, Westport.